Description: This poster is an A3 poster in blue. The image is of a woman with her fist raised, holding a broken chain. 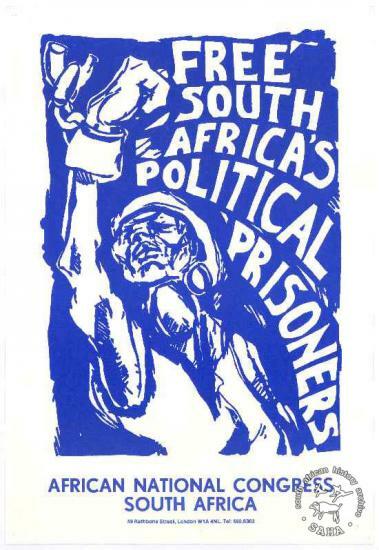 The text reads: "Free South Africa's Political Prisoners : AFRICAN NATIONAL CONGRESS : SOUTH AFRICA : 49 Rathbone Street, London W1A 4NL. Tel. 580.5303". Included in SAHA exhibition kit and virtual exhibition, titled 'Women hold up half the sky: commemorating women in the struggle'.